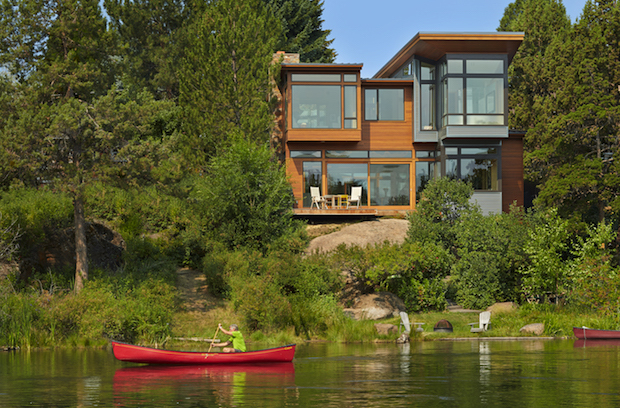 A modern home in Bend, Ore., by Seattle-based architect Nils Finne and builders Tim and Trevin Duey, clad in corrugated metal and red cedar, met the constraints of a tight riverside lot and the desires of a couple embarking on a new phase of life (Photos: Ben Benschneider). Empty-nester homes offer clients a rare chance to make a space-efficient dwelling that checks only their own design boxes, without having to consider the competing needs of children. These clients are in a unique position to take all of the opportunities good design has to offer. And, as the following two projects show, the homes often connect with nature in a deeper way. The town of Bend sits in the high desert of central Oregon along the Deschutes River, a magnet for water lovers. Architect Nils Finne’s clients, Bob and Deborah, deemed it the ideal place to retire, and the outdoorsy Portland transplants asked the Seattle architect to create a light-filled home that takes advantage of its perch 25 feet above the river. The 2,945-square-foot house offers a sense of prospect and refuge, and its wall-size doors are an open invitation to the river. Finne managed to make something poetic out of the site’s constraints, which include a narrow 50-foot-wide by 119-foot-long lot, a volcanic rock outcrop and precipitous slope to the river, and close neighbors on both sides. The clients got a variance to push the house about 7 feet into the front setback to keep the rock outcrop exposed in the back and maintain a more deferential relationship to the river. 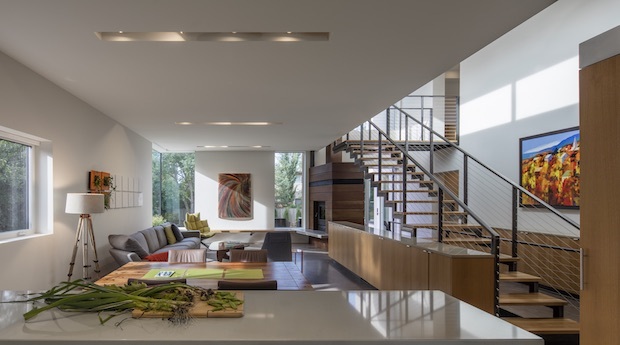 With the street on the west side and the river to the east, the house wraps around a south-facing landscaped courtyard, which scoops direct light into the center of the transparent living space. A long, skinny, two-story volume runs along the northerly edge—a datum line for the lower modules placed against it. This long volume, clad in horizontal corrugated metal, cantilevers the farthest toward the river. It houses one of the two garages, a corridor, and the kitchen on the first level; and two bedrooms, a laundry, and the master bath upstairs. The abutting red-cedar-clad lower volumes face each other across the courtyard, with the massing on the street housing another garage and the entryway, and the river-facing volume containing the kitchen and living room downstairs, and the master bedroom and study above. "It's a highway of water fun," says architect Nils Finne of a stretch of the Deschutes River in Bend, Ore.,, where his clients chose to retire. Built on a steep site and a volcanic outcropping of rock, the home's design maximizes its relationship to the river. As on the exterior, interior materials are skillfully crafted and used in unexpected ways. There is a 1 1/2-foot elevation change from the front to the back, which results in generous 12-foot ceilings in the living spaces. This allowed Finne to suspend two undulating wood panels, which echo the river beyond, from the ceiling over the kitchen island and in the living room. They’re also a curvaceous foil to the boxy living and dining areas. “I often create living spaces with a sculptural roof form when there is no second floor above the living area,” he says. “Because I couldn’t do that—the master bedroom is above the living room—I introduced panels that drop down and form a sculptural river landscape that ripples above you when you’re sitting in those spaces” (see sidebar). 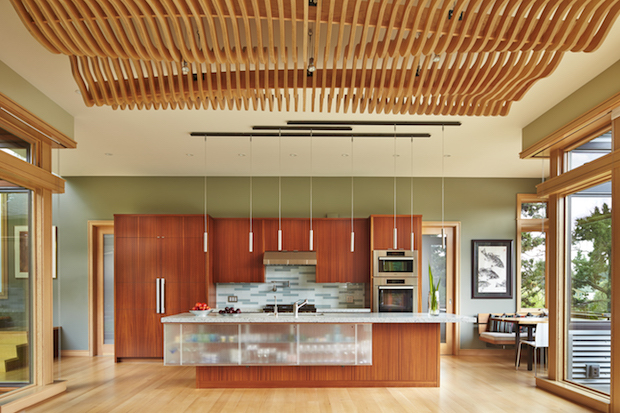 The undulating ceiling panels that connect the dining room and kitchen offer a contrast to the box-like nature of the spaces. The panels, suspended from the ceiling by aircraft cables, are 6 feet long and 3 1/2 feet wide. Architect Nils Finne, principal at Finne Architects, in Seattle, sketched out the pattern, modeled it in 3-D, and created an elaborate instruction manual showing where to cut each piece. 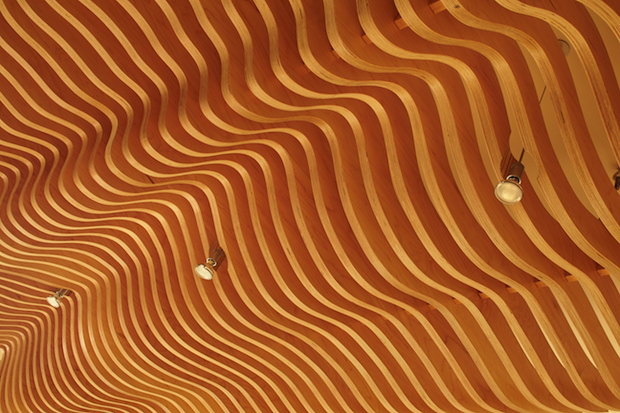 The 60 unique slats were cut from a sheet of veneer maple plywood using a computer numerical control (CNC) machine and mounted 2 inches apart on perpendicular runners that thread through the slats, bending up and down to follow the contours. The two fireplaces, in the living room and the upstairs study, share a chimney and a vocabulary of local stone and steel. The stones’ horizontal cut ties into the horizontality of the house, and their earthy colors reflect the high desert region. A local steel fabricator, Ponderosa Forge, made the sculptural fireplace mantels and the blackened steel staircase. Another local company, Eco Crush, made the kitchen counters out of a terrazzo-like cementitious matrix with pieces of embedded glass. Finne kept the glass theme going on the sapele mahogany kitchen island, which contains a display case made of low-iron textured glass. “Behind that glass we have some LED lighting, so the glass case glows like a piece of ice,” Finne says, and the kitchen backsplash is a variegated glass tile. Most empty-nest projects have a mandate to downsize. They’re laser-focused on creating just-so spaces where the owners will spend most of their time and letting gratuitous square footage go. That was the case for Tucson, Ariz.-based Ibarra Rosano Design Architects, whose clients were Canadians who planned to retire to Tucson, where they spent their winters. The clients are both pilots, and Ibarra Rosano had proposed a strongly horizontal house in Tucson, called Desert Wing, which focused on distant views, with a curved roof swooping out like an airplane wing, providing shade in the hot desert climate. Aging in place was top of mind of the owners of this modern home in Alberta by Ibarra Rosano Design Architects and Jillian Builders. Living areas and the master suite are on the main floor, with guest quarters above. The design can accommodate the later addition of an elevator if needed. The design played out as two stucco volumes with a vertical Cor-Ten steel-clad connector that delivers a constant glow to the living spaces. “The home’s form had a lot to do with bringing in light and having that light in the places they use the most,” Rosano says. The main living spaces, including a patio and deck, unspool along the south and east, while the garage is on the north, where winter storms come from. The central entry hall/stairwell connector has high clerestories on the south side that bounce light down, even to the basement, which contains the geothermal mechanicals and a playroom for visiting grandchildren. With the living areas and master suite on the main floor, the clients have the option of aging comfortably in place. And although the entry is a few steps higher than the street, a lift could be incorporated from the garage to the house, if necessary. Because of deep setbacks on all sides of the 75-foot-by-128-foot lot, Rosano stacked two guest rooms and a bath over the garage, stepping them back from the front façade in keeping with the neighborhood scale. Other homes in the neighborhood also have flat roofs, which surprised the architect. “We assumed a sloped roof made more sense in the snow, but that’s not necessarily so because the snow can serve as an insulator,” says Rosano, whose team designed a flat structure calculated for snow loads and drifts. Exterior stucco is as common in Alberta as it is in Arizona, but “it’s different from what we have in Arizona,” she says. “Theirs isn’t painted and has sand in it with sparkle.” Cor-Ten steel on the connector and garage doors contrasts with the stucco while being durable, low-maintenance, and relatively affordable, she adds. Builder Derek Deibert, president of Jillian Builders, in Edmonton, fitted the garage doors with heavy-duty commercial hardware to handle the added weight. The frameless corner windows in the kitchen and living room presented another challenge throughout design and construction. “They had to be shored up for three weeks while we waited for the ICF [insulated concrete form] exterior walls to fully cure because there was no structural support for the weight of the roof in the corner,” Deibert says. Those windows bring sunlight and views into critical places, but also control privacy. “The kitchen looks out onto the suburban street, and rather than put a predictable window in the center of the kitchen looking out to the neighbor’s front door, we put windows on the corners so you’re seeing the cedar trees in the neighbor’s yard,” Rosano says. In the living room, the corner window became the husband’s favorite spot for reading the paper, drinking coffee, and soaking in the light and warmth, she adds. 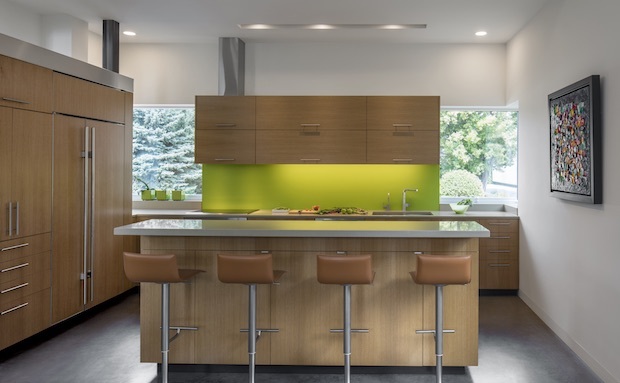 The home’s interior material palette is pale and understated, to reflect light, with pops of color from art, furnishings, and the kitchen’s bright green, back-painted glass backsplash. Flooring on the main level is radiant-heated colored concrete, while the cabinetry and second-story flooring is white oak. Over-troweling the concrete floors when they were almost hard created a marbleized effect, Deibert says. While this house is quite different from the defunct Desert Wing design, it addresses similar issues of protection from extreme elements. Whether you’re shaded by an elegant roof in the desert or soaking up the winter sun in Canada, that visceral sense of comfort is a hallmark of A+ architecture—and a quality everyone understands.